Self Care Strategies for Families with Children with Disabilities. SMART IEP goals are Measurable! What does SERC provide to schools, SoonerStart sites, and families at no cost? Training on communication and collaboration skills to help prevent conflict. An IEP Facilitator to manage conflict during contentious IEP meetings. A Mediator to guide a structured process in which parents and school personnel can resolve specific issues related to special education. A Due Process Hearing Officer at an administrative hearing to resolve, that could not be resolved at an earlier stage. During the resolution time of the process, SERC can provide a facilitator to help the parties discuss the hearing issues in a safe and structured setting and try to resolve them if possible. You may experience special education services on an individual and personal basis day to day. Have you wondered what is happening with Special Education on a national level for all kiddos - Ages 0 to 3 in Part C and Ages 3 to 22? 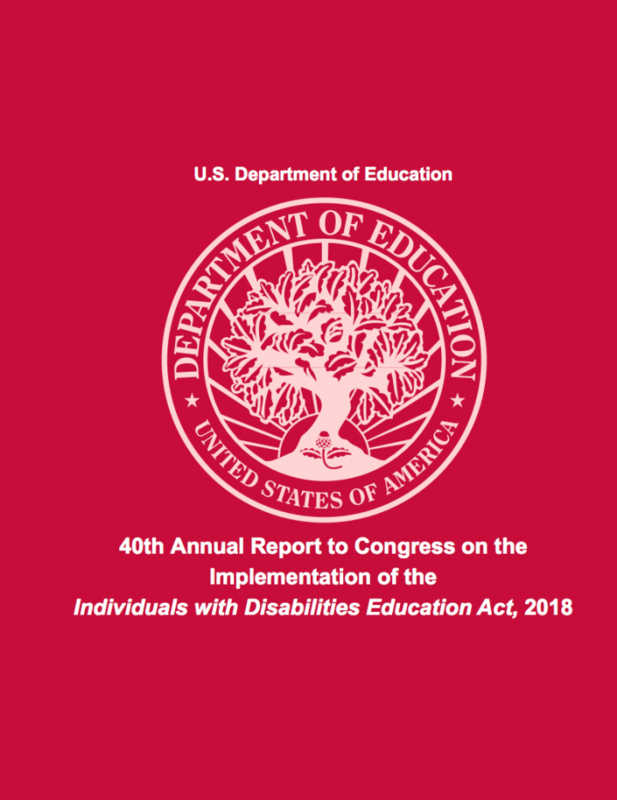 The 40th Annual Report to Congress on the Implementation of the Individuals with Disabilities Education Act was submitted to Congress in 2018. The report shows trends over the last ten years in graduation rates, identification rates of each category and many more interesting facts! 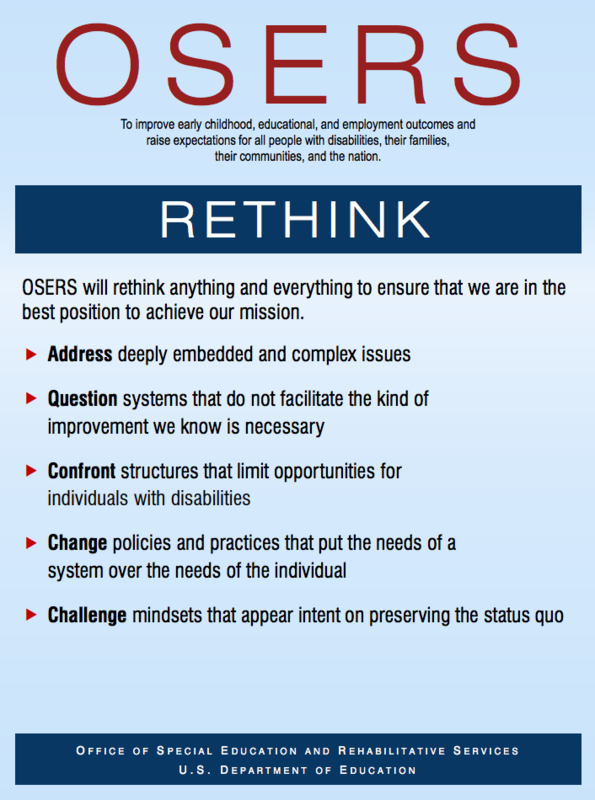 OSERS mission is to improve early childhood, educational, and employment outcomes and raise expectations for all people with disabilities, their families, their communities, and the nation. Johnny Collette, the new Director of OSERS, recently released a framework to show how his department will fulfill their mission. Take a look at this information to see how the U.S. Department of Education will work to make their mission a reality. CADRE is sponsoring another fabulous webinar! Missy Longman shares with us important self-care strategies in this archived presentation. Having a child with disabilities can put a strain on families and care providers. It is important to take care of yourself so that you can lessen the stress and enjoy precious moments. Your child’s IEP will have annual goals that lay out what he’ll be working toward over the school year. To help him get the most out of the IEP, those goals shouldn’t be vague or general. Instead, they should be SMART: Specific, Measurable, Attainable, Results-oriented and Time-bound. 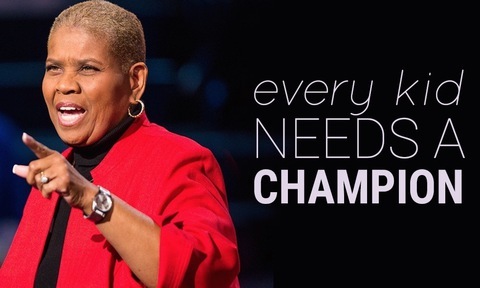 Rita Pierson is an inspirational speaker and a very wise educator! These videos are fun to watch and only take a few minutes. They remind us that relationships are the foundation of good communication, that respect builds that relationship, and that these relationships touch us in beautiful ways! Enjoy!